Congratulations to the winner of our join-our-mailing-list-and-win-a-book draw – Jude Marentette from Saltspring Island, Canada. The draw is now closed but you can still sign up and get free cartoons by email any time. WIN the *funniest* book about meditation EVER! 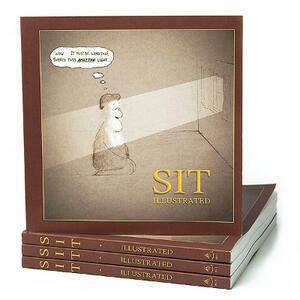 Join our free meditation cartoon delivery newsletter and you’ll be automatically entered to win a copy of the first printing of Sit Illustrated, a brand new book of cartoons made by meditators! Plus, you’ll receive the occasional meditational cartoon in your email, brightening your day with a new, funny, and sometimes even inspiring illustration on the subject of the wonderful, paradoxical, and occasionally ridiculous practice of sitting. Just enter your email address below, click ‘submit,’ and you’re set! You’ll get a message with a link to confirm your email address, and once it’s confirmed, you’ll be automatically entered in the meditation book draw. A random email address will be picked as the winning subscriber on May 31th — just a few weeks away. (Of course you can remove your email at any time — and even if you opt-out of the newsletter, you’ll still be eligible to win a free copy of the book, so you win either way). Author adminPosted on April 23, 2010 April 28, 2011 Categories NewsTags contest, meditation book, meditation cartoon book, meditation newsletterLeave a comment on WIN the *funniest* book about meditation EVER!